Entrepreneurs speak at the E@NU conference Friday. The annual event brought entrepreneurs from across the country to Evanston. Northwestern hosted a conference Friday which focused on the up-and-coming in the entrepreneurial world and opportunities for college students. The event, called Entrepreneur@NU and themed “Next Frontiers,” was hosted by the Farley Center for Entrepreneurship and Innovation, in partnership with student group EPIC. About 130 participants attended the conference at Norris University Center, with 90 percent of attendees being undergraduate and graduate NU students. 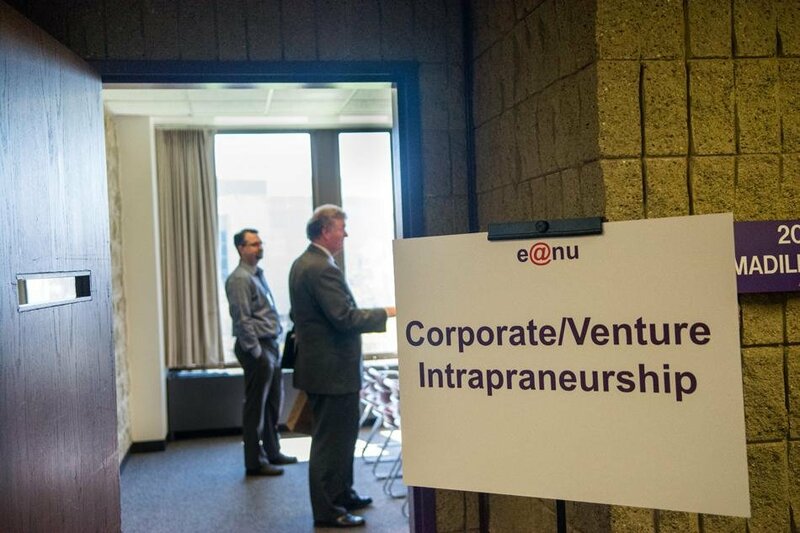 E@NU offered five distinct tracks for NU’s budding entrepreneurs: Entrepreneurial Marketing, Design Thinking, Students/Researchers Becoming Entrepreneurs, Corporate/Venture Intrapraneurship and Women in Entrepreneurship. The conference’s two keynote speakers were Ben Parr (Weinberg ’08), former editor-at-large of the news blog Mashable, and Norbert Riedel, president and CEO of the neuropharmaceutical company Naurex, Inc.
SESP senior Josephine Lee, student coordinator for the Farley Center and former EPIC co-president, said the conference was a success because of its small setting. Lee, who has been involved with the Farley Center for three years, was enthusiastic about the conference’s keynote speakers, Parr in particular. Parr spoke toward the end of the conference about his time at Mashable, as well as his current entrepreneurial pursuits. His book, “Captivology: The Science of Capturing People’s Attention,” will be released in early 2015. His talk was followed by a question-and-answer session where attendees asked questions about the future of social media and technology. McCormick sophomore Roy Yu, a member of EPIC, said he was impressed overall with the event, but said he wished more students had attended. One of those interested students was Lauren Straus, a Weinberg senior who is working on a startup herself. She is a participant in a NUvention course, a two-quarter project in which students work to create a web-based business. Straus said the conference was both intriguing and important.